Hello, my wonderful friends! 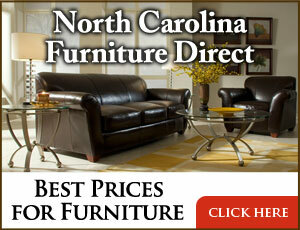 It’s great to have you here for a new “Interior Design Ideas”. 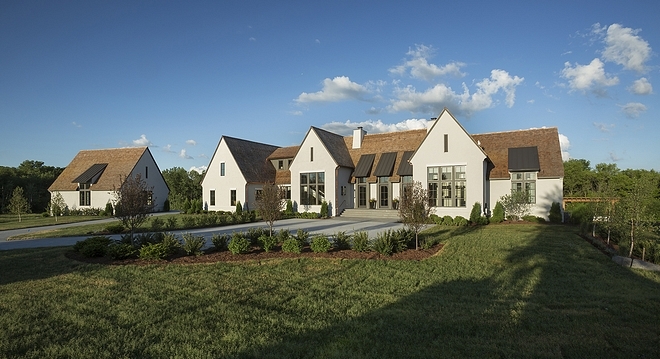 Meticulously built by Hendel Homes and with interiors by Danielle Loven of Vivid Interior Design, the architectural direction of this Modern English Tudor residence expertly balances modern and traditional elements, reflecting on the common threads of an English Tudor country house and Hamptons grandeur. The result? 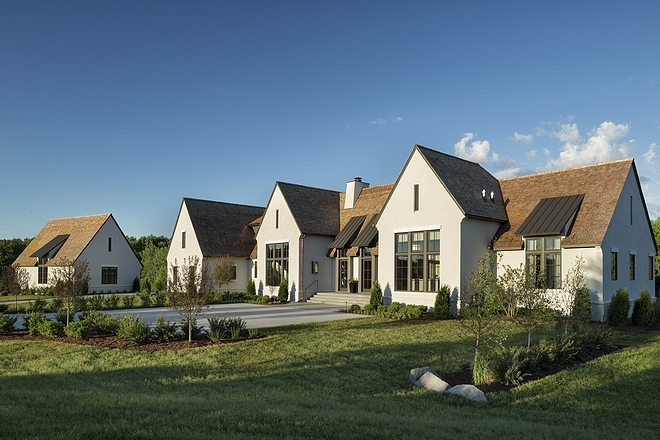 A casual, sophisticated home that feels perfectly at ease in its Midwestern foundation. This modern reinvention of timeless design delights with highly refined and detailed living spaces spread over three floors and I am sure this house tour will inspire you from the beginning to the end. 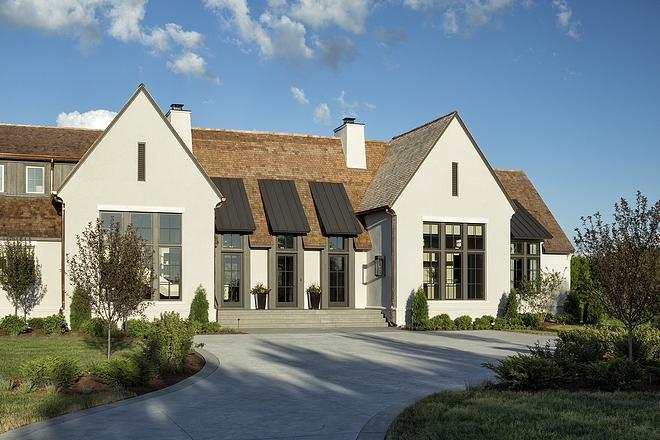 This home is a flawless modern interpretation of English Tudor architecture and it’s situated at the end of a cul-de-sac in a quiet neighborhood in Minnesota. 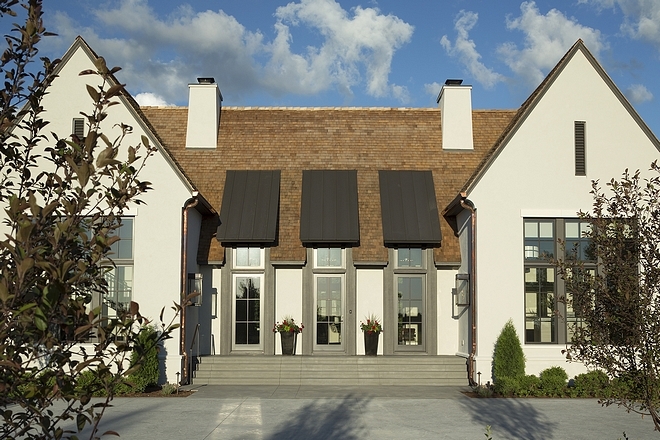 The stucco is custom color. Windows are Marvin Windows in “Bronze”. Porch flooring is stamped concrete. 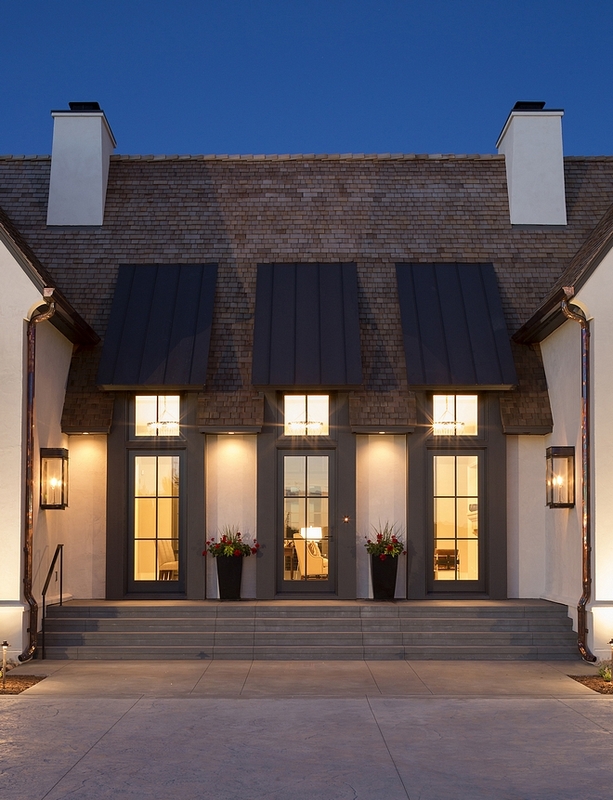 This expansive home features an open layout, 7,836 square feet, 4 Bedrooms & 7 Bathrooms. 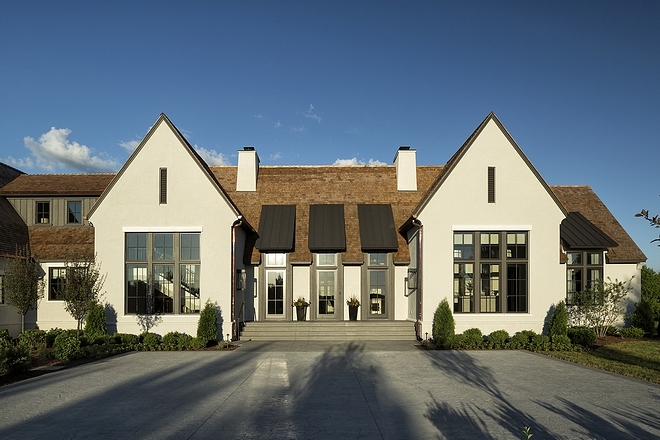 This home is a classic car collector’s dream! 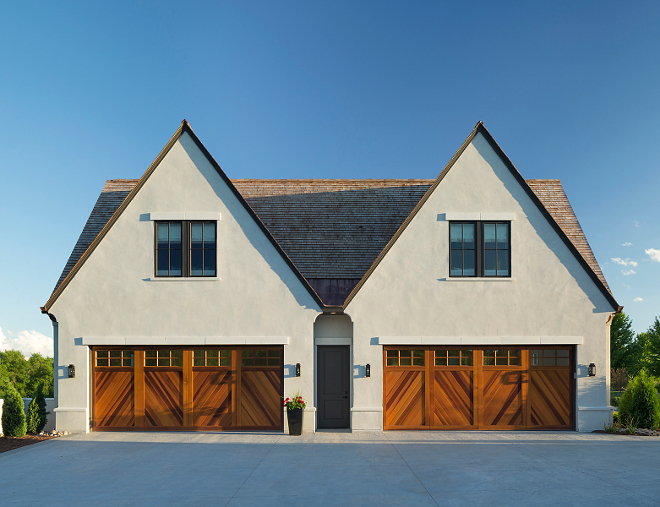 The home comes with a two level four-car attached garage plus detached garage with storage for up to 10 more vehicles. 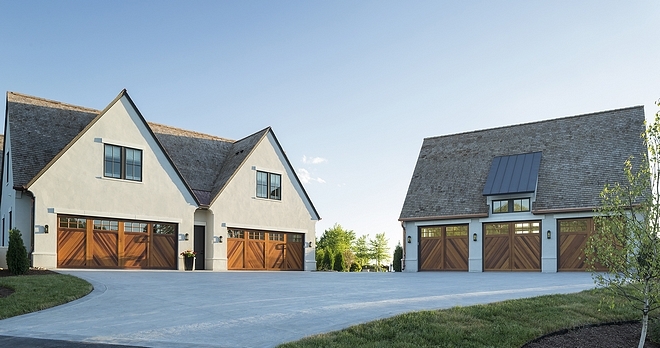 The garage doors are custom. Roof is combination of Cedar Shake and metal. Front Door: Marvin Windows in “Bronze”. I love the symmetry the windows on each side create. Lighting: Flambeaux Gas Lanterns – Other Beautiful Outdoor Sconces: Here, Here, Here, Here, Here & Here. Similar Planters: Here (fiberglass) & Here (ceramic). You will find in this home an unsparing collection of exclusive finishes throughout, from designer wall-coverings, marble mosaics, double herringbone and concrete tile with vintage graphic detail to custom furniture and lighting, all presented with a curated approach that is both upscale and welcoming. 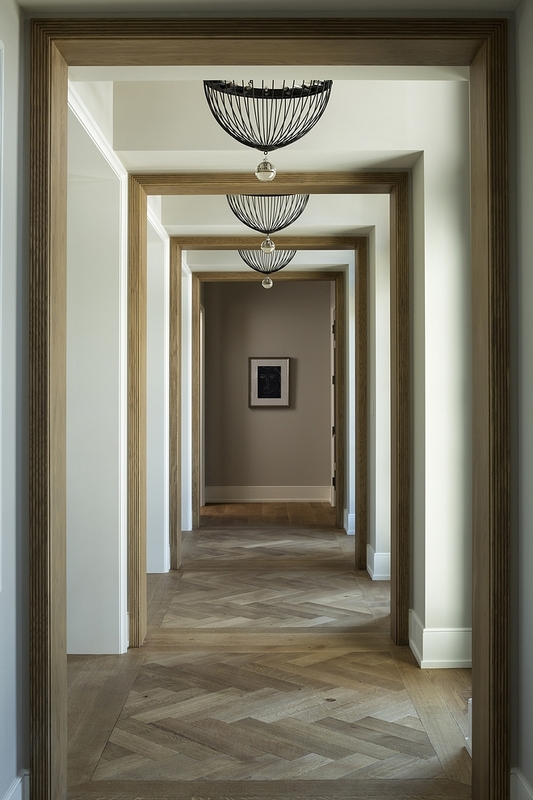 Hardwood Flooring: 6″ Riffed and quartered white oak, eased edge, custom Stain – with Herringbone inset pattern at raised ceiling locations. Foyer Lighting – Arteriors (discontinued) – similar here. 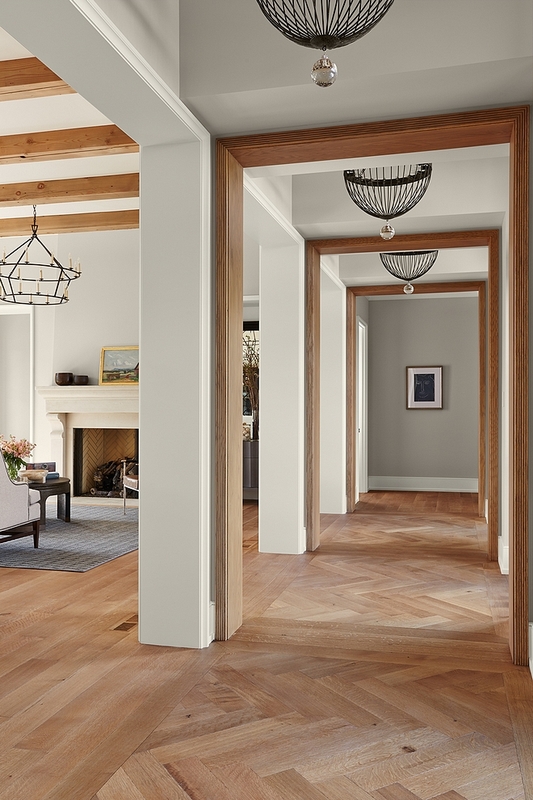 The foyer opens directly to this spacious and elegant Great room. Paint color is Benjamin Moore Collingwood OC-28. All furniture is available through the designer. Metal and Leather Accent Chair – Casa Midy. Black Raffia Coffee Table: Bernhardt. 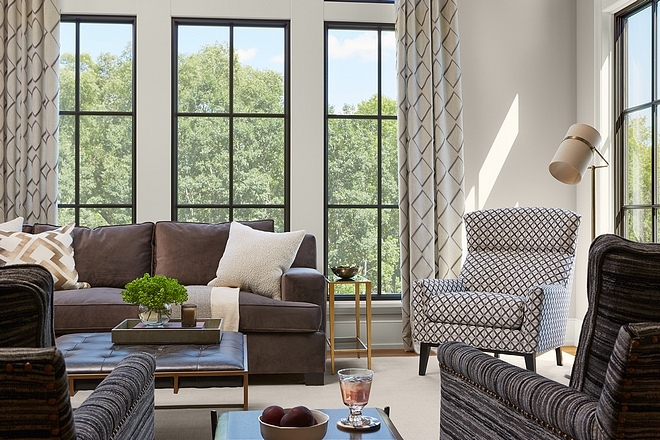 Sofas from Hickory Chair in Designer’s Guild fabric. 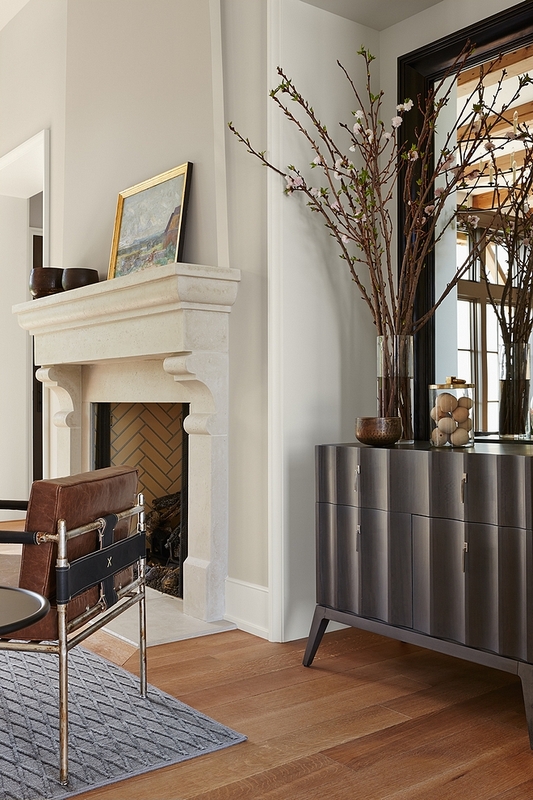 Fireplace is Limestone by Francois & co.
Art & Accessories from Vivid Home. The open-air environment is flooded with natural light and enhanced by a consistent color palette which connects the spaces perfectly. 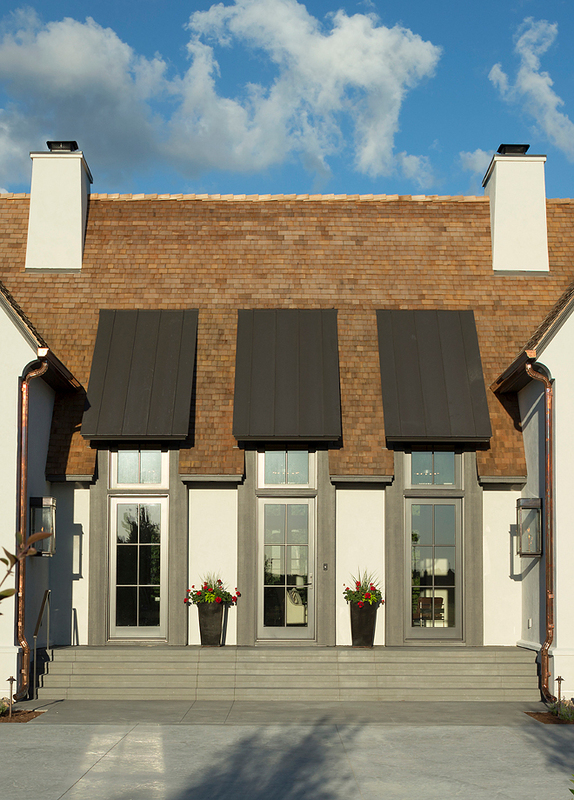 Interior windows are painted to match the Marvin Bronze in “Sherwin Williams Medium Bronze”. Pillows: Throw Pillows in Beacon Hill Fabric. Dining Chairs: Custom – Host Chairs in Maxwell Fabric. 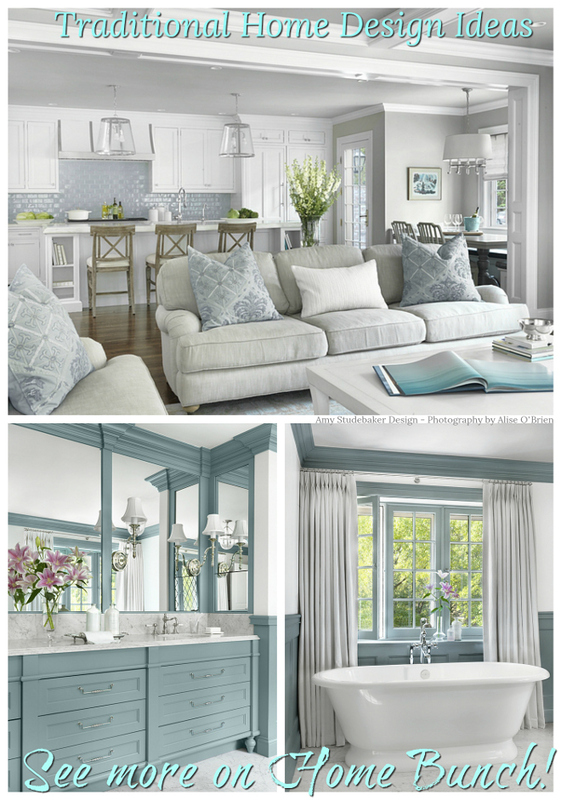 Ceiling Paint Color: 50% Classic Gray by Benjamin Moore/ 50% Collingwood OC-28 by Benjamin Moore. 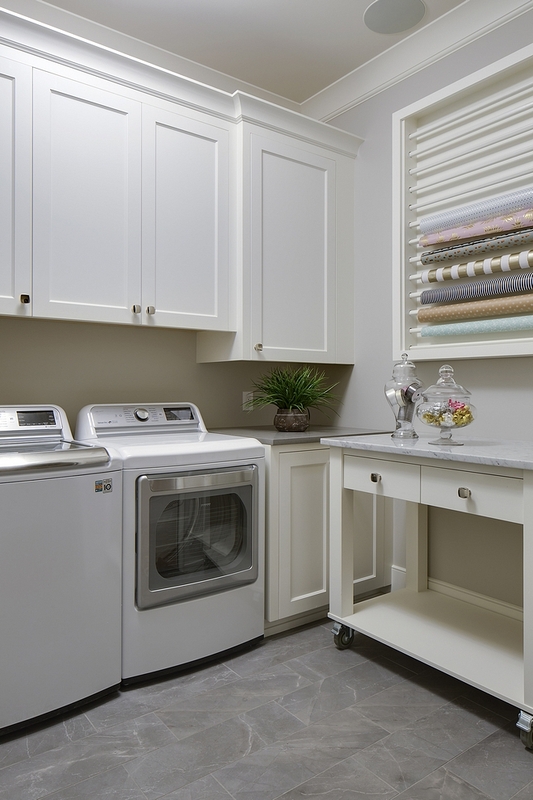 Casework Paint Color: Casework – Benjamin Moore White Dove OC-17. Natural metals, woods, and organic materials conform in new ways with classic silhouettes and rich textures. Antique Dough Bowl: Here & Here. 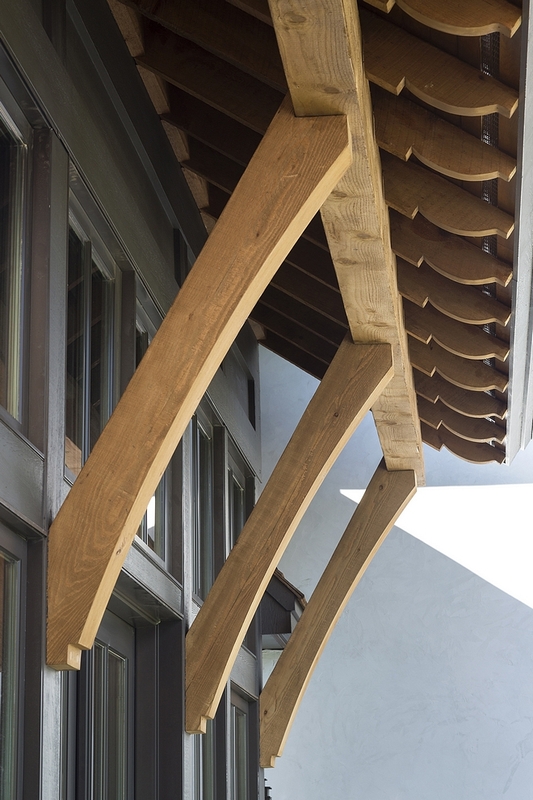 Ceiling Treatment: Reclaimed Alder Beams. The ceiling height in this space is 12′. 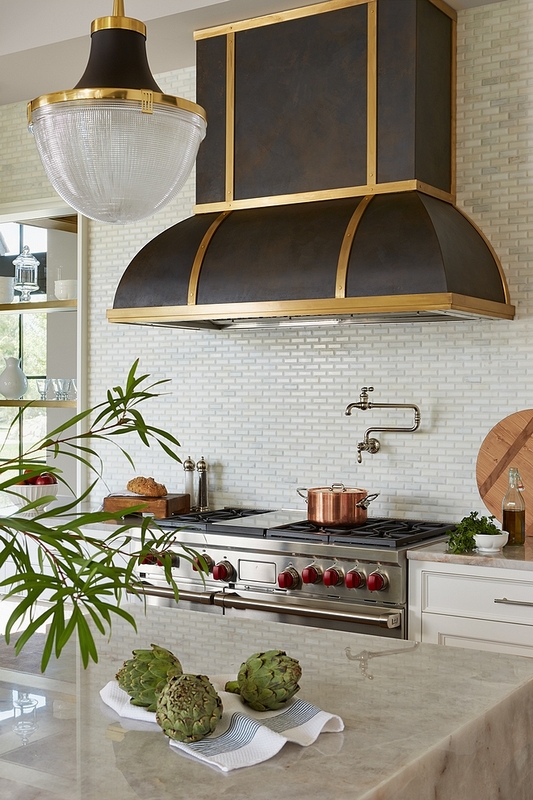 This extraordinary kitchen features a custom range hood and open shelving in aged brass and zinc finishes. 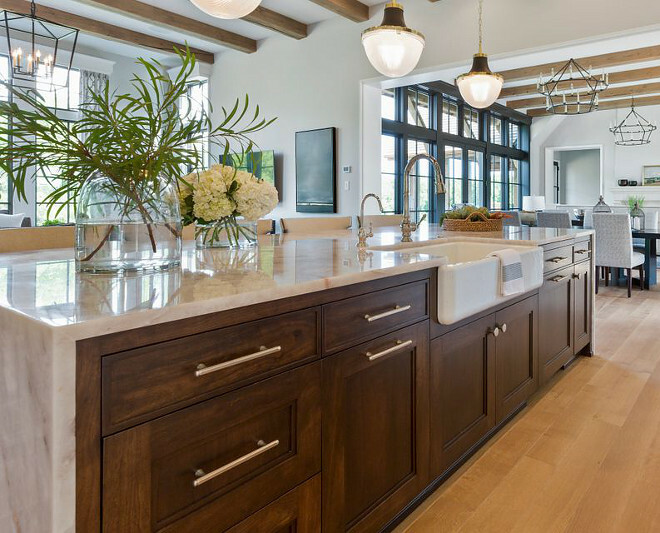 Kitchen island is made of Walnut. 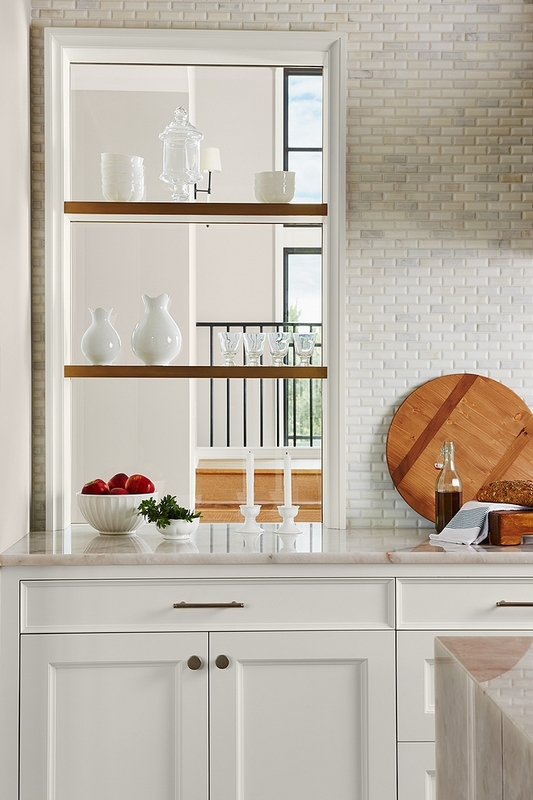 Backsplash is Jeffrey Court Calcutta marble mosaic tile – installed only at the range wall. Small Scale beveled subway 12″ x 12″, mesh mounted – similar here, here, here & here. Pot Filler: Kohler Artifacts Pot Filler. 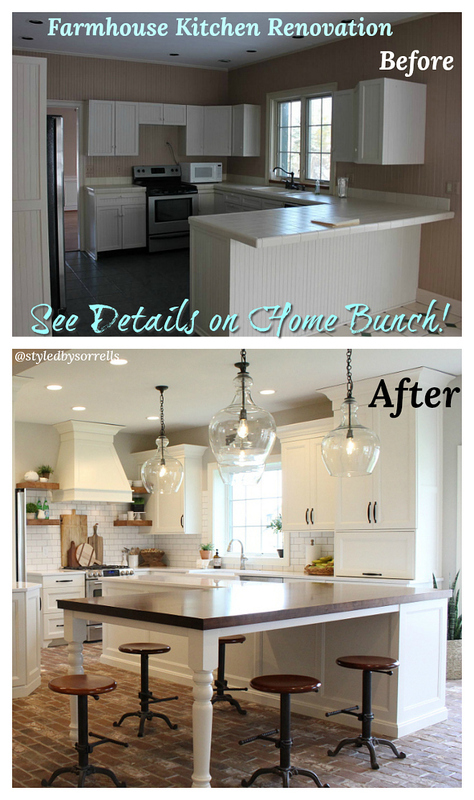 Perimeter Kitchen Cabinet Details: Painted Flat panel with custom moldings. Paint color is Benjamin Moore OC-17 White Dove. Backsplash Between Fridges: Cistallo Quartzite Full Height. Countertop is Cristiallo Quartzite, waterfall edge. Kitchen Sink: Kohler K6427-0 Whitehaven. Kitchen Faucet: Kohler Artifacts Pull-Down Faucet. Filtered Water Faucet: Newport Brass. Counterstools are available through the designer. 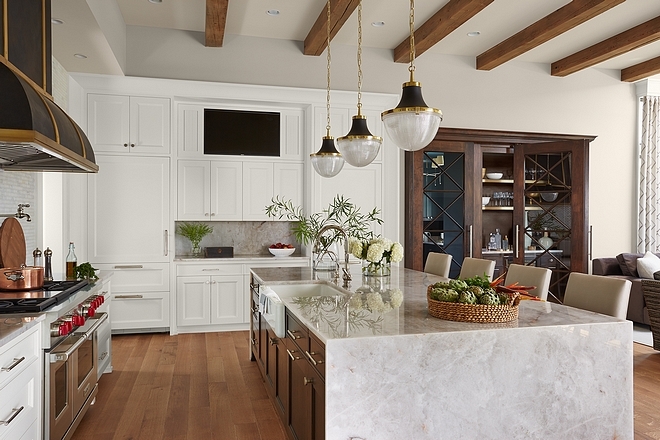 This kitchen is full of inspiring ideas! 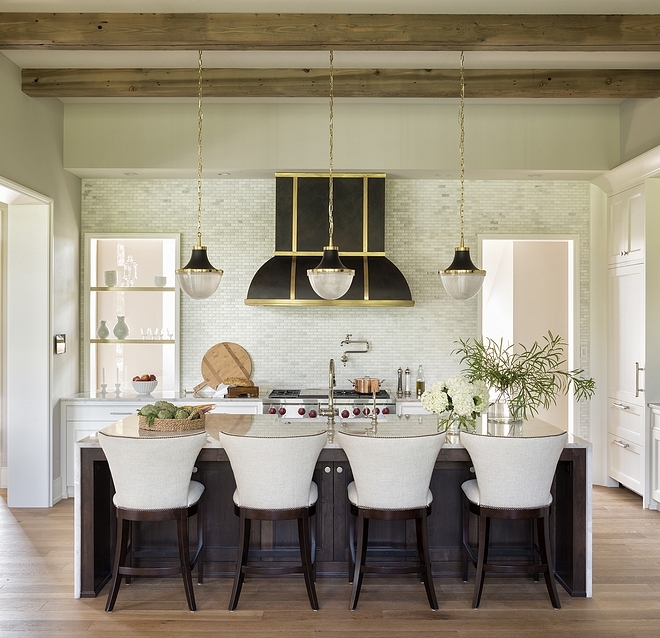 To keep a sense of symmetry (see picture above), the designer added a glass opening to the wall with brass floating shelves. Hardware – Ashley Norton – similar Pulls & Knobs. 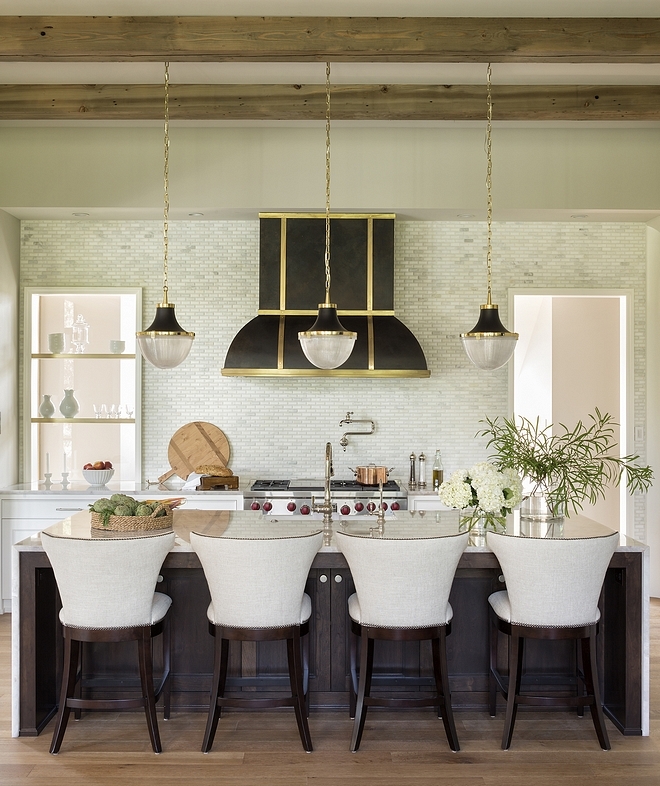 Light fixtures in iron and brass lend the property a distinct architectural edge. Pendants are Robert Abbey. 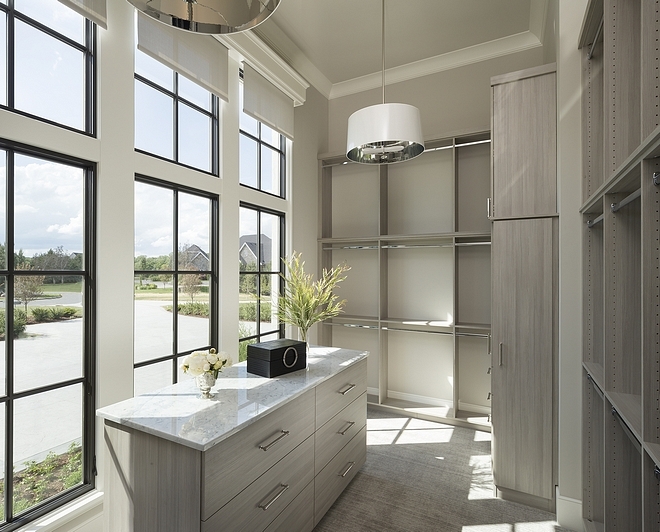 A custom buffet is flanked by paneled refrigerator and freezer by Subzero. 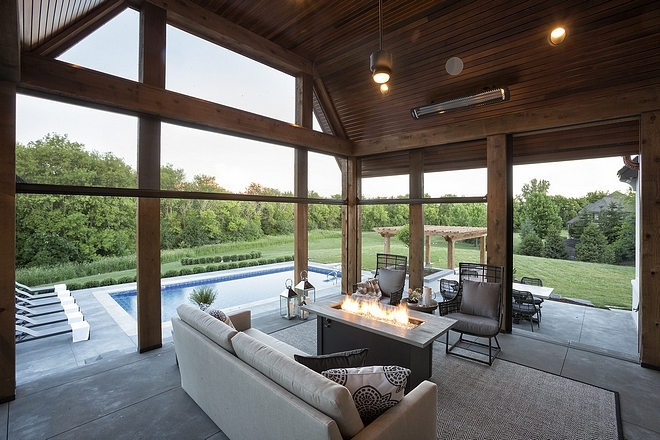 The optimized floor plan offers formal and informal spaces that open to the exterior grounds for fluid indoor/outdoor living and entertainment. Wall paint color continues to be Benjamin Moore Collingwood. A TV is placed in the custom hutch. The kitchen opens directly to a very comfy and stylish family room/lounge area. Notice the high ceiling, the beams and the tall windows. 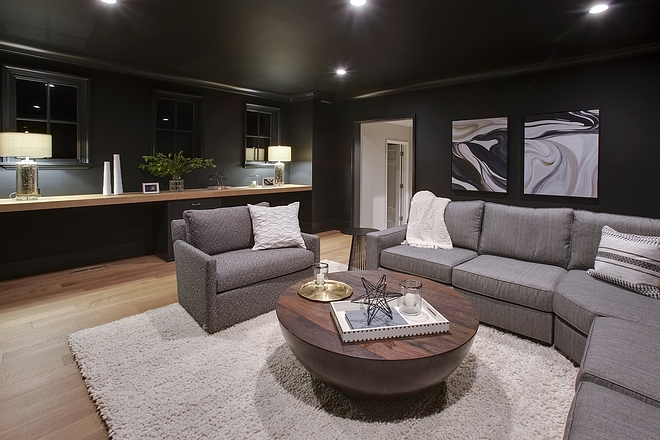 Custom Sectional from Vivid Home. Accent Chair in Clarke & Clarke fabric. 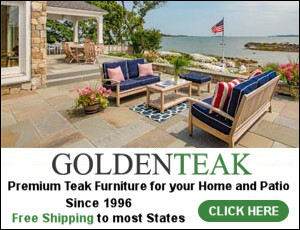 Accent Tables from Modern History & Currey & Co. Throw Pillows in Opuzen fabric. 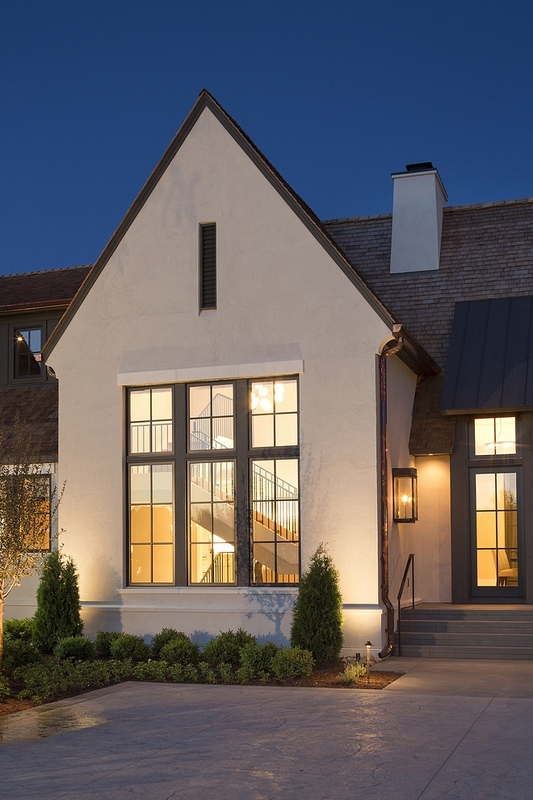 Lighting: Visual Comfort Extra Large Lantern in Aged Iron. Leather Tufted Ottoman: Four Hands. 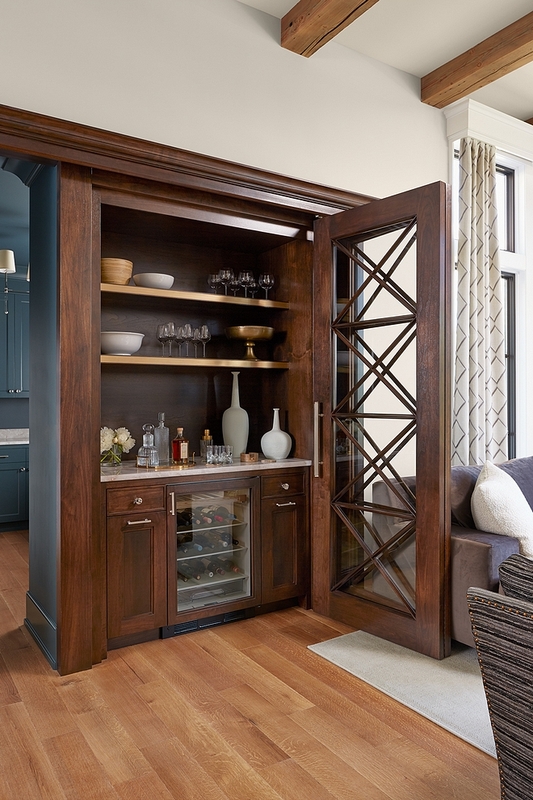 Custom Walnut doors with glass X insets conceal the butler’s pantry and a bar. 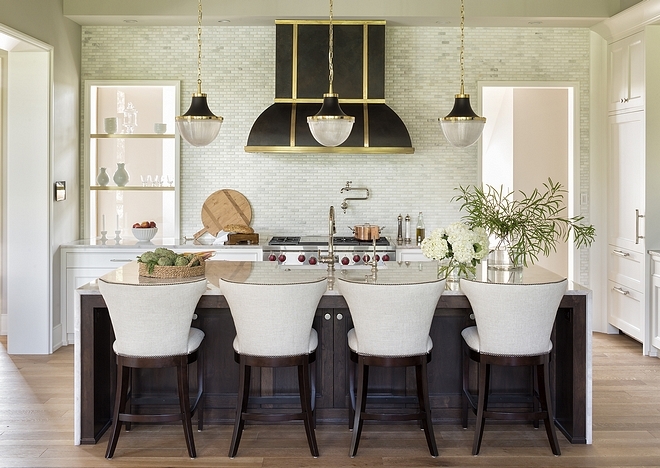 The bar features Walnut cabinetry with Cistallo Quartzite countertop and floating brass shelving. 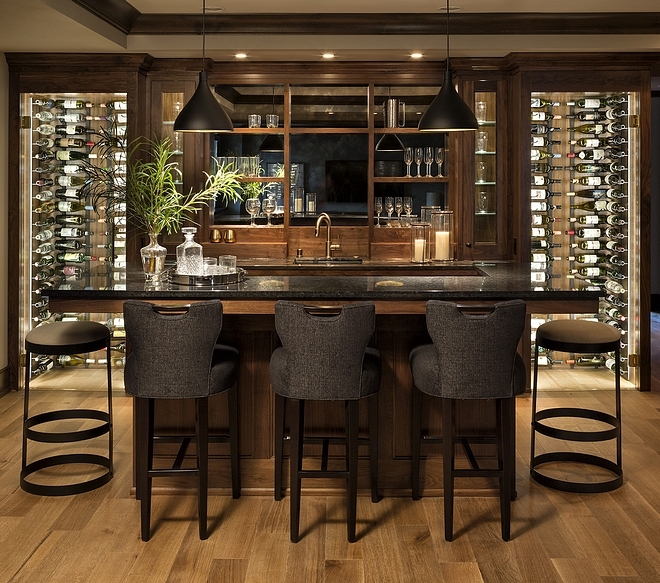 This butler’s pantry is truly a dream! 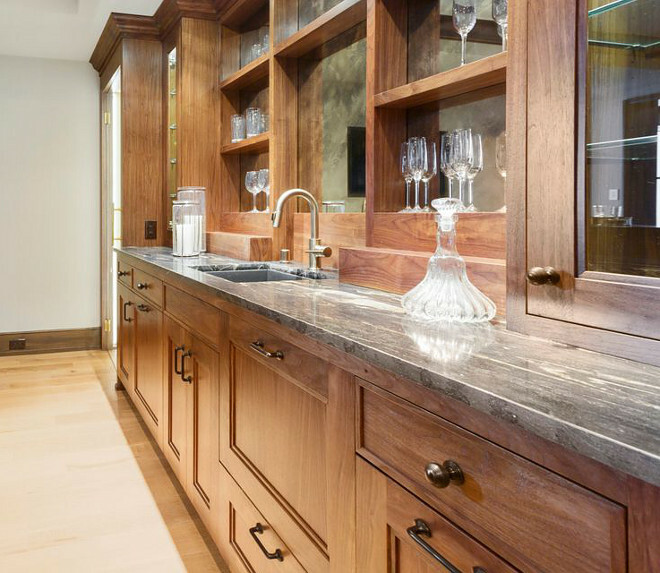 Countertop is Cistallo Quartzite. 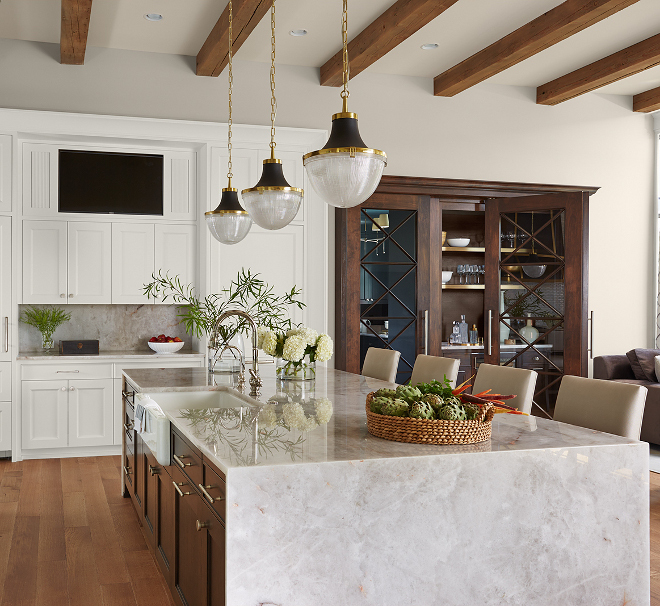 Backsplash: Cistallo Quartzite 4″ Height. Sherwin Williams SW 7625 Mount Etna. Roman Shade in Romo fabric. Sink: Blanco B401734 Ikon Apron Front Sink. Faucet: Kohler Artifacts Pull-Down Faucet. 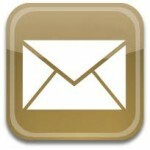 Appliances: Wolf Ovens and Bosch Dishwasher. 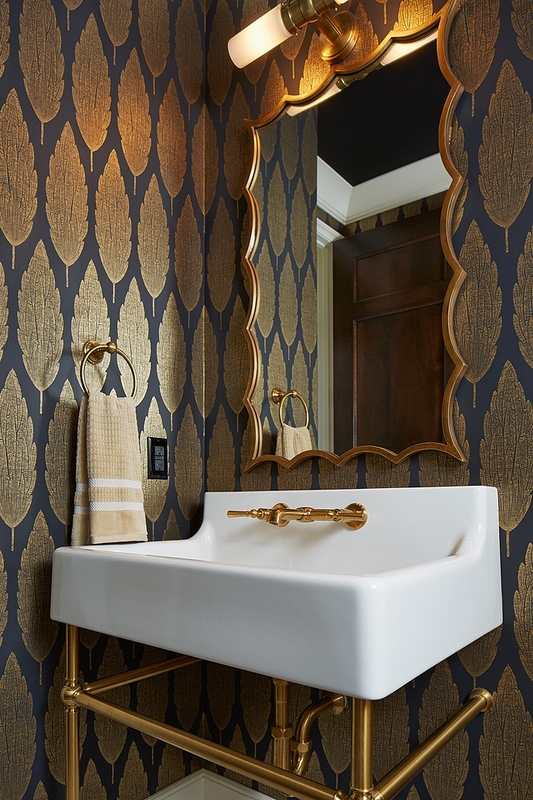 Located just off the mudroom, this powder room is elegant and features a gorgeous wallpaper. 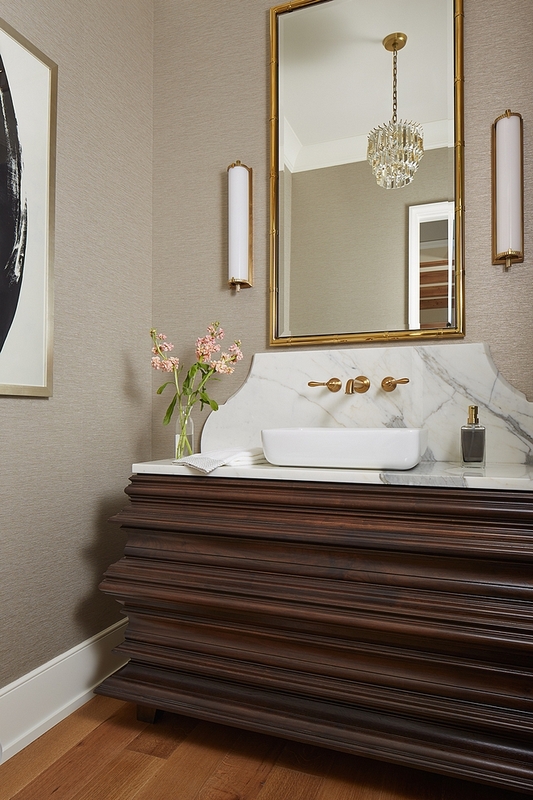 Bathroom washstand is DXV – similar here & here. Faucet is DXV – similar here. 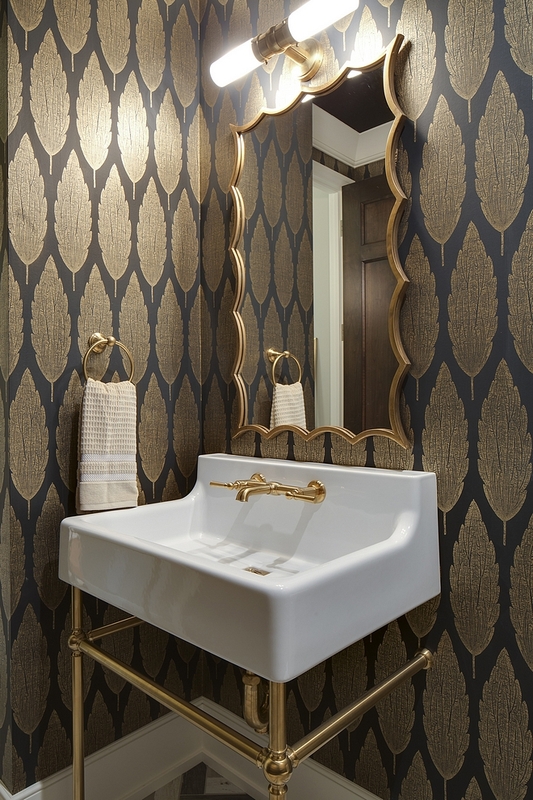 Wallpaper is Wallpaper: Osborne & Little Nina Campbell Gold Leaf On a Black Background. Ceiling: Sherwin Williams Tricorn Black SW6258. My jaw just dropped! 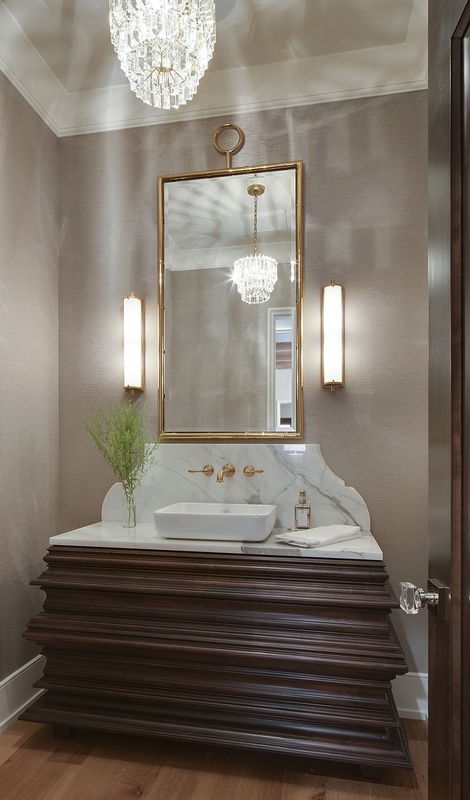 Vanity is Walnut, custom-designed. 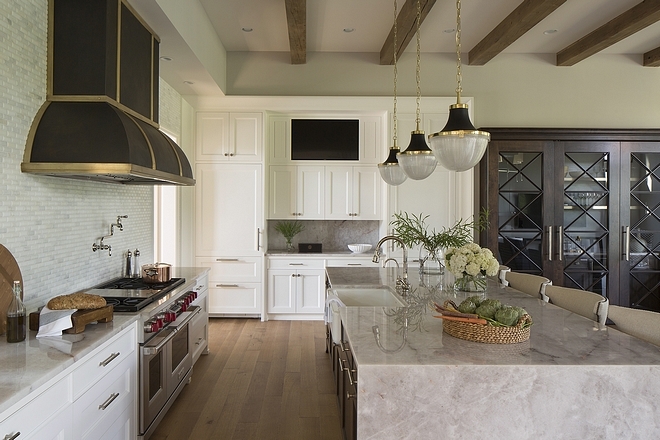 Countertop and backsplash is marble. Sconces: Visual Comfort Light in Hand Rubbed Antique Brass 4”W x 20.5”H. 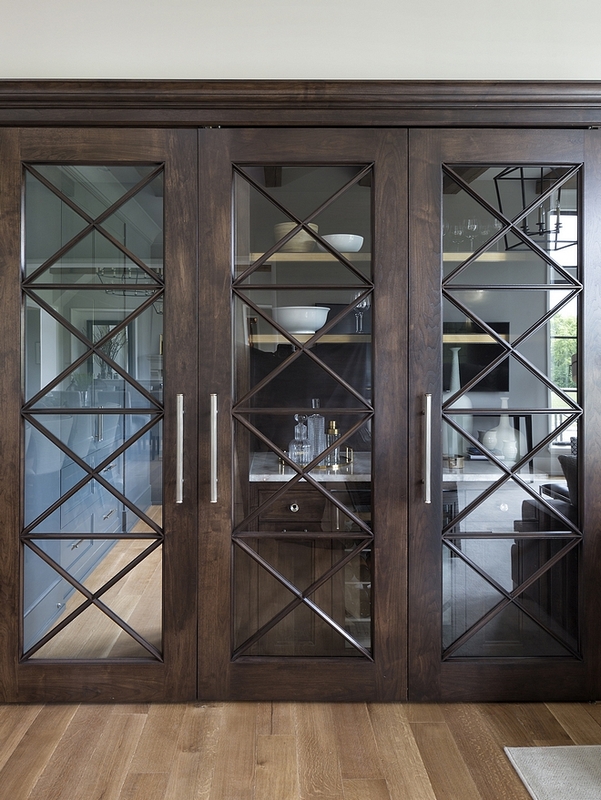 Interior doors are Alder – custom stained. Wallpaper: Schumacher Metallic Strie Silvered Taupe (available through the interior designer). 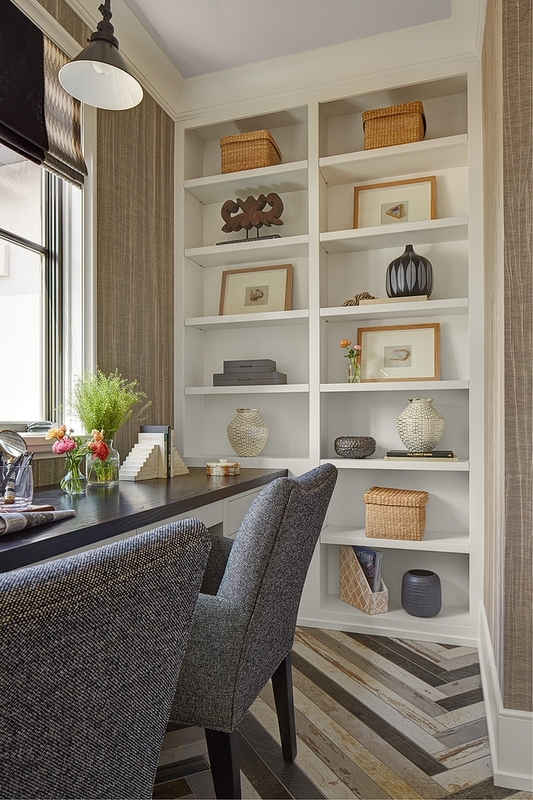 Custom desk and bookcase are painted in Ben Moore White Dove OC-17. Desk top is Oak, dark stained. Roman Shades in Robert Allen fabric. Wallpaper is Innovations Achel. Ceiling paint color 50% Ben Moore Classic Gray / 50% Collingwood OC-28. 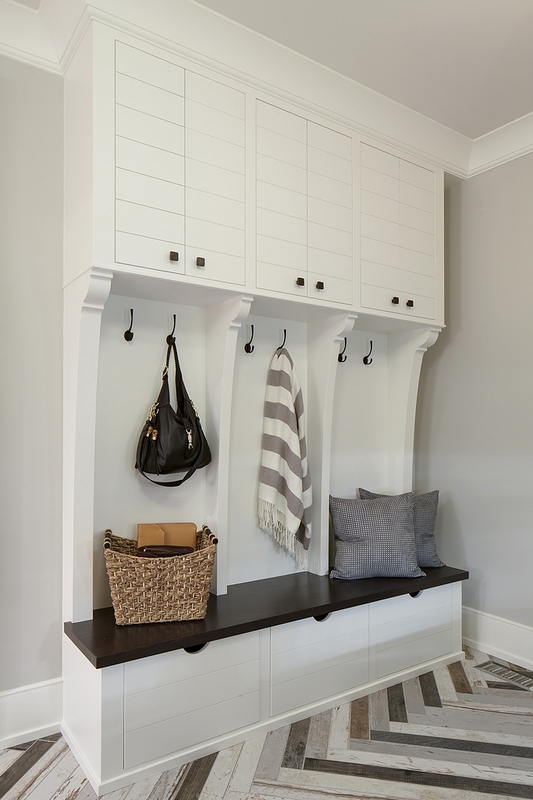 Mudroom Flooring: American Florim Charleston 3×36 Glazed Porcelain Tile, Rubble Tile, colors: White, Grey and Timber – installed in a Herringbone patterned. 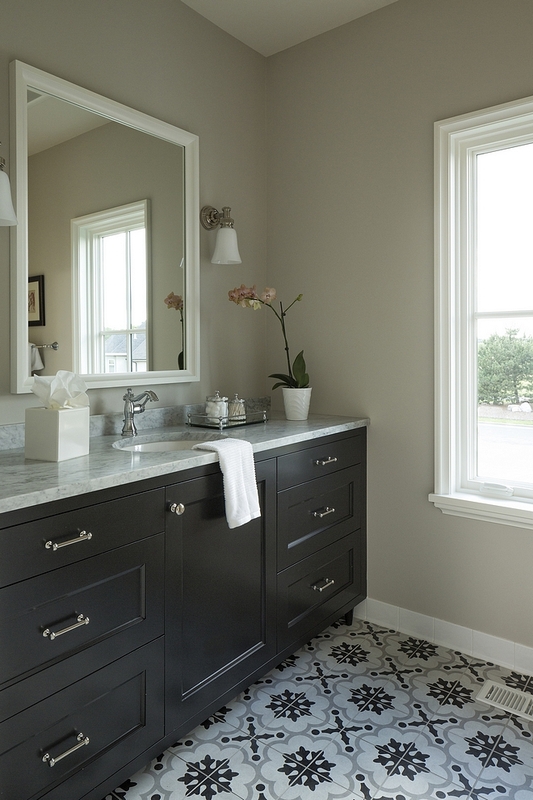 Grout: TEC Dove Grey. Wall paint color is Benjamin Moore Collingwood. Cabinetry isBen Moore White Dove. Bench is Oak with a custom dark stain color. Baseboards: 11″ – Paint Grade. 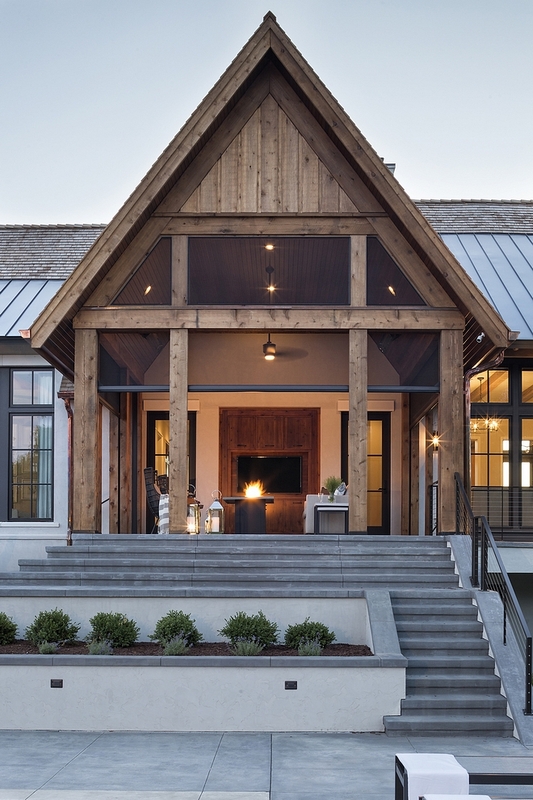 Natural metals, woods, and organic materials conform in new ways, with classic silhouettes and luxurious textures. 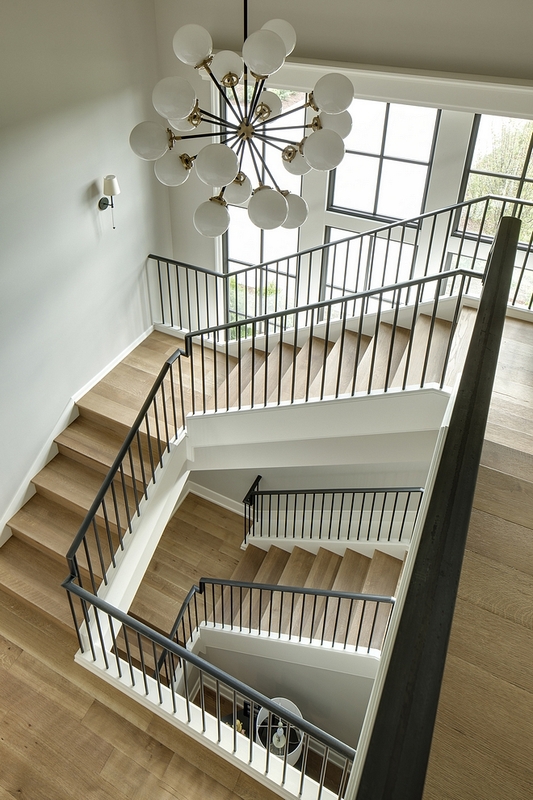 This gorgeous staircase features White Oak wood treads and wood risers. 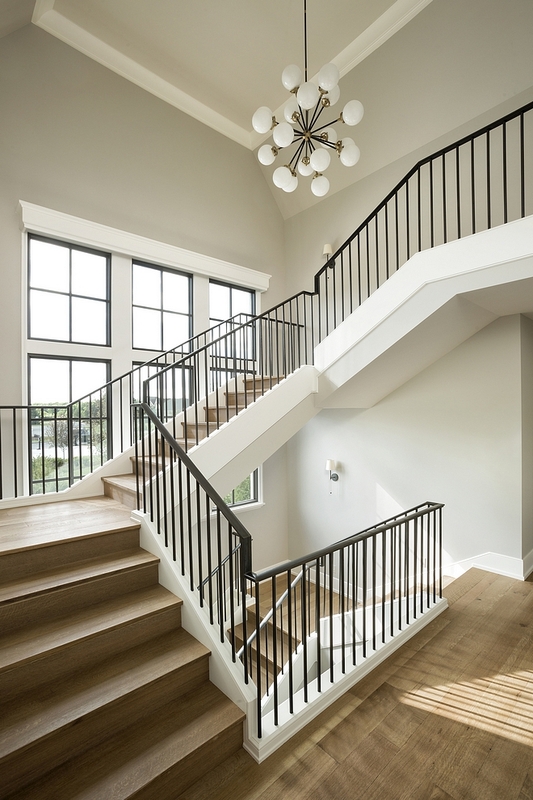 The metal railing is custom. Window Trim: Sherwin Williams Medium Bronze. A close-up on this stunning metal railing. How beautiful, right?! The staircase leads to the kids’ lounge/bonus room. The doorway seem here leads to the kids/teens ensuites and a laundry room. Paint color is Benjamin Moore Black Jack 2133-20. 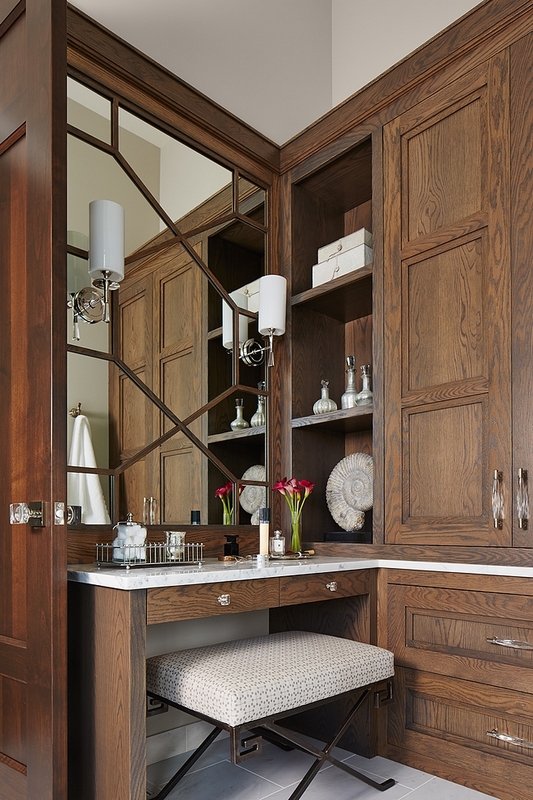 This room features a long custom desk with White Oak top, custom cabinetry and comfortable furniture. Coffee Table: Here – similar here & here. Main Walls: Benjamin Moore Gentleman’s Gray 2062-20. Bookcase Wall: Benjamin Moore Gentleman’s Gray 2062-20. Euros in Design Tex plaid. 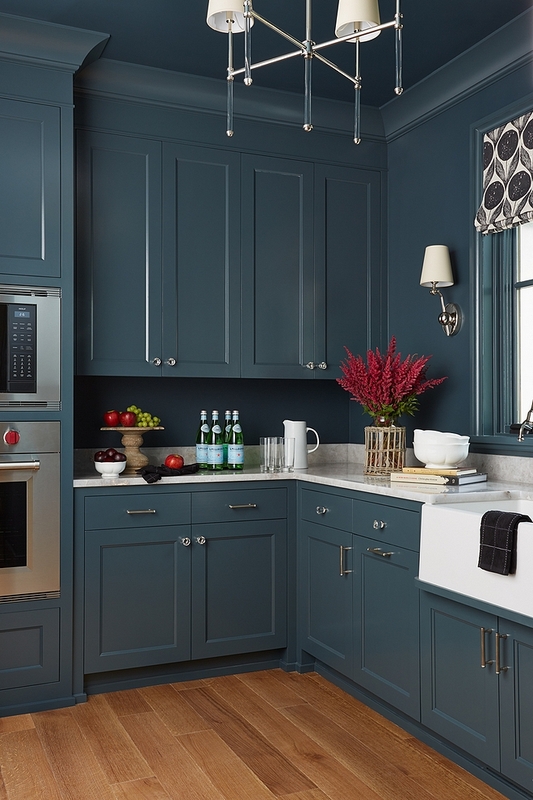 Cabinet: Sherwin Williams Tricorn Black. Floor Tile: 9.5″ x 19.25″ Enlonged Hex Jeffrey Court Artic Stone Field Hex. Accent wall is painted in Benjamin Moore 2117-30 Shadow. Walls are Ben Moore Collingwood OC-28. Bed is custom. Euros are in Harlequin fabric – Beautiful & Good Quality Bedding: here, here, here & here. Roman shade in Cowtan and Tout fabric. Bolster is in a Robert Allen fabric. 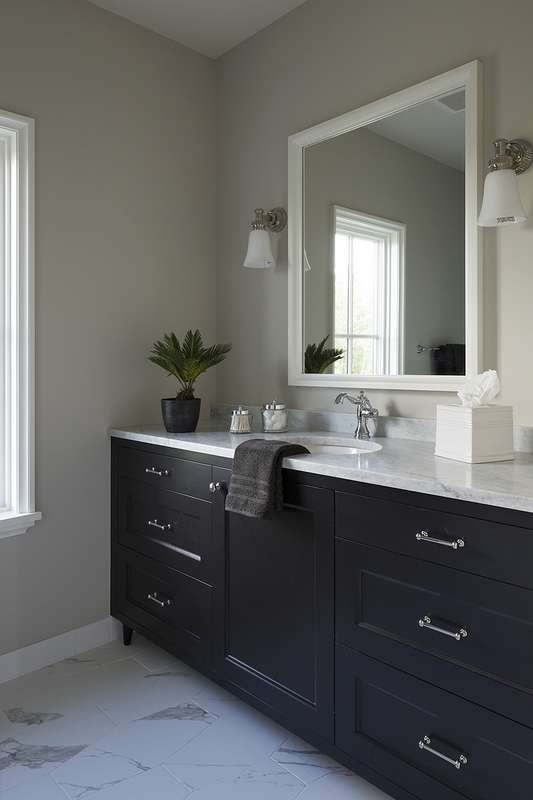 Bathroom Cabinet: Sherwin Williams Tricorn Black SW 6258. Floor Tile: 8″x 8″ Geometric Printed Tile Fioranese Ceramic #45 Certosa – similar style: here. Ceiling paint color is Benjamin Moore Black Jack 2133-20. Wall color is Benjamin Moore OC-28 Collingwood. Euros, Accent Pillows and Roman Shades in Kravet Fabric. Settee is custom with Romo Black fabric. 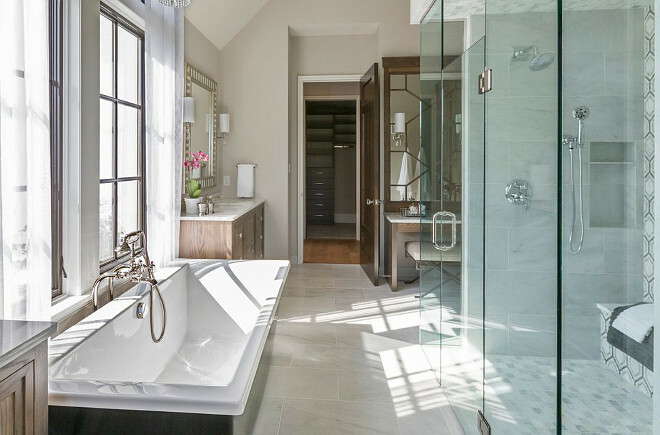 The master bathroom is luxurious and features a great layout. Vanities are custom stained Oak. 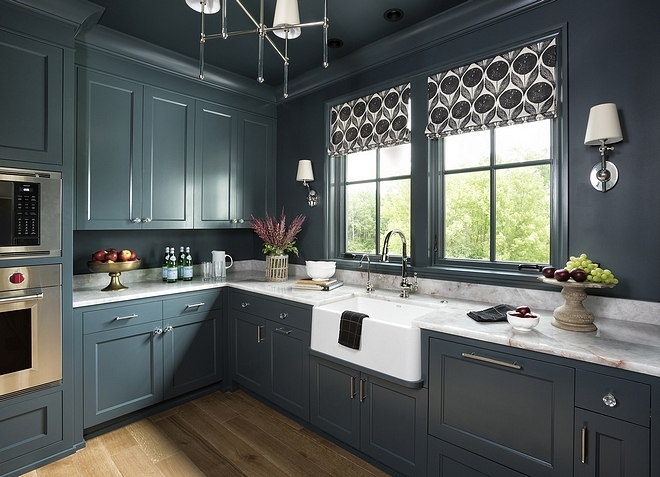 Tub Filler: DXV – similar here. Shower Walls: 12x24” Honed Marble Tile – similar here. 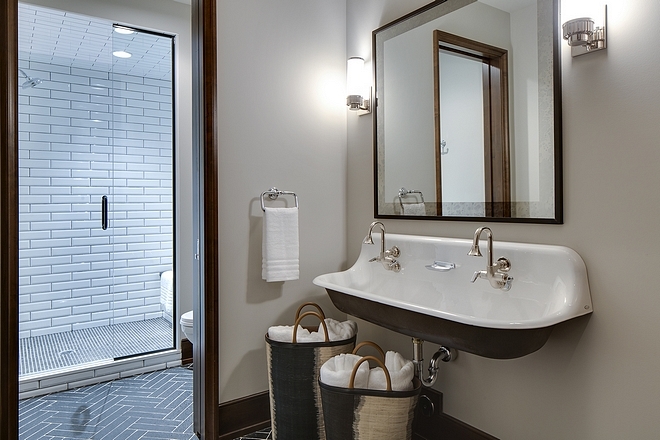 Shower Floor: 2x2” Honed Carrara Marble Tile – similar here. Hexagon Marble Mosaic Tile: here. Floor tile is 12×24 London Calling Honed marble tile (similar here). Wall color is Benjamin Moore Collingwood. 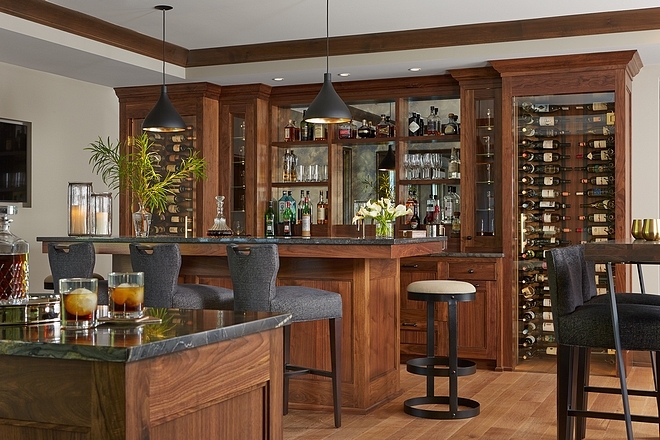 I absolutely love the stain color on this Oak cabinetry. It works beautifully with the white marble. Beautiful and practical make-up vanity. Flooring: Carpet; Black Label #2403 Tip sheared wool/viscose blend. Countertop is Quartz, Caesarstone Pebble. Flooring: Porcelain Tile – 8 x 24 #53 West End Pulpis by Tile x Design – similar here. Sink: Kohler Brockway wash sink – 48″. Floor: 2x10” textured black ceramic tile in herringbone pattern – similar here. Shower Floor: 1x1” Black ceramic hexagon tile – similar here. Shower Wall: 3x12” Beveled white ceramic tile – similar here. 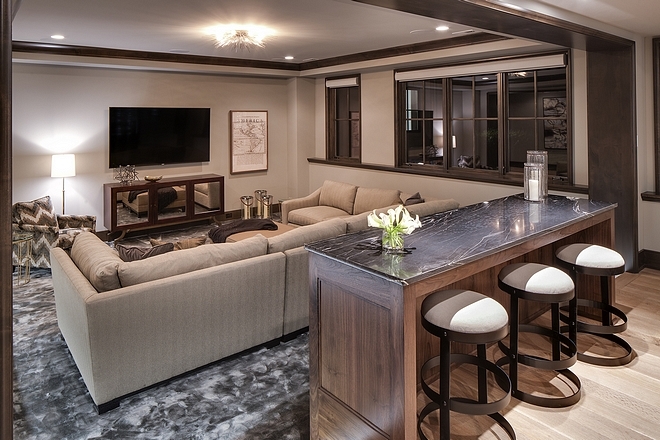 A custom built-in whisky bar and custom-designed abstract glass shelving are just the beginning of an amazing lower level designed for fun. The pub table/island is custom. Cabinetry is Walnut; Dark Custom Stained. 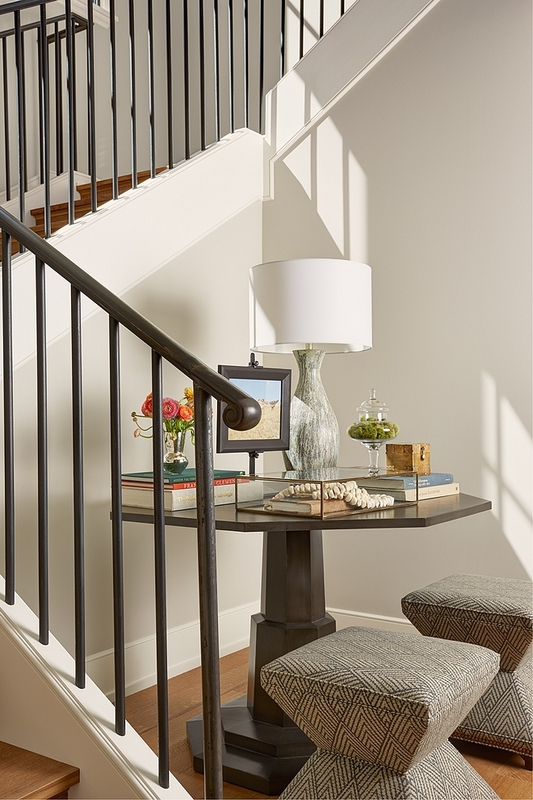 Basement Paint Color: Collingwood by Benjamin Moore. Lounge Chair in Opuzen Flamestitch fabric. Countertstools: Iron Counter Stools from Noir. 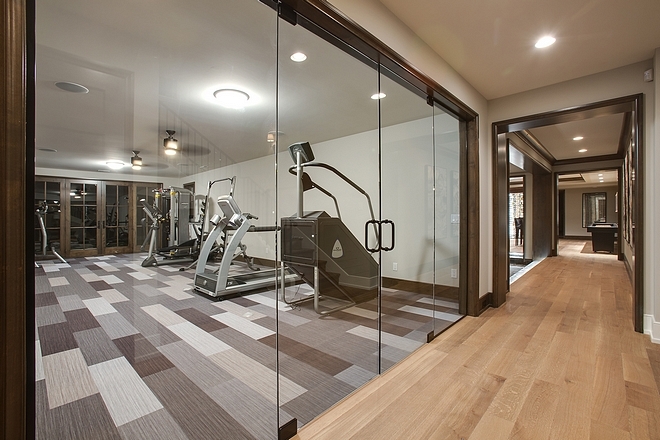 The exercise room features custom stained wood with walls painted in BM Collingwood OC-28. 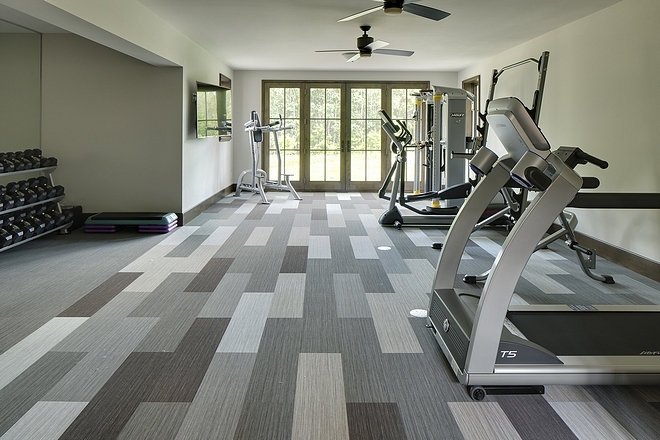 Floor: Forbo Carpet Tiles. It’s antimicrobial and wears amazing. This was a glue-down installation. 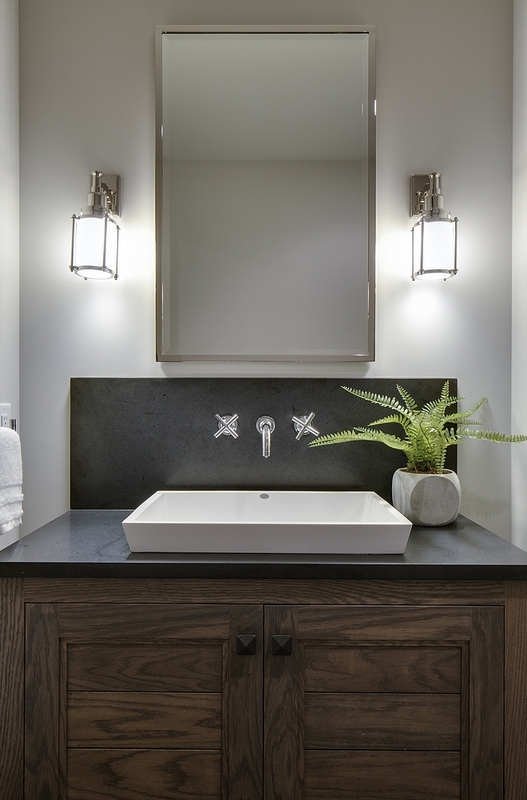 The gym bathroom features a custom vanity with dark quartz countertop and slab backsplash. Similar Medicine Cabinet: Pottery Barn. 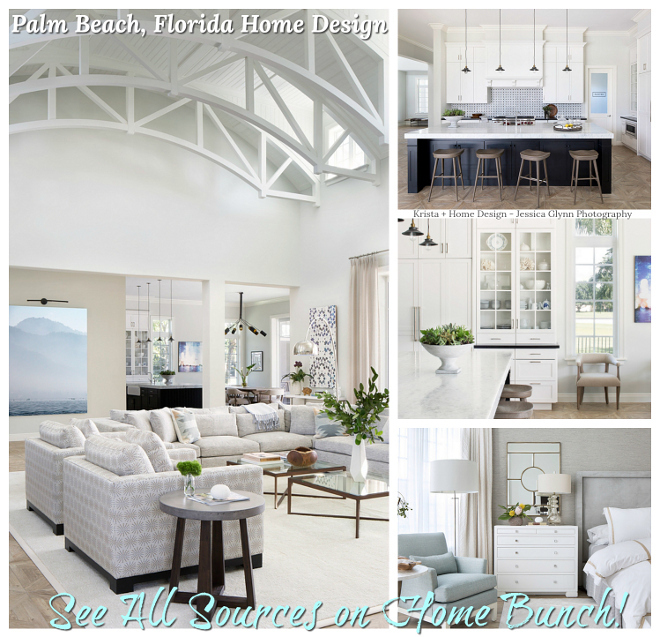 Design meets function, delineating an optimized floor plan with formal and informal spaces that open to the exterior grounds for fluid indoor/outdoor living and entertainment. Ceiling is Cedar planks and flooring is stamped concrete. Outdoor Sofa by Century Furniture. Notice the outdoor built-in. 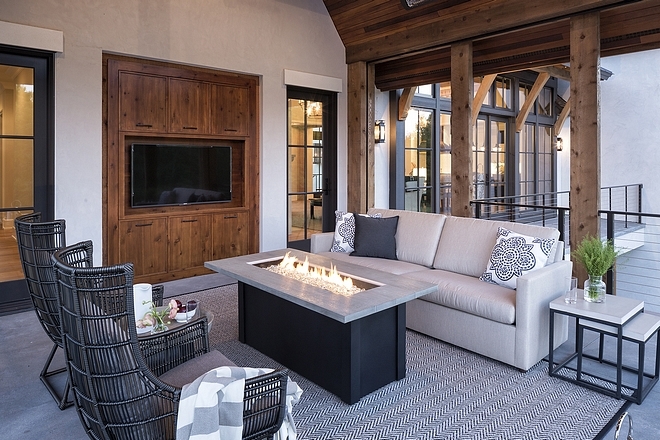 Fire Table from Outdoor Rooms – similar here. The screened porch is 17’4” x 15’6”. 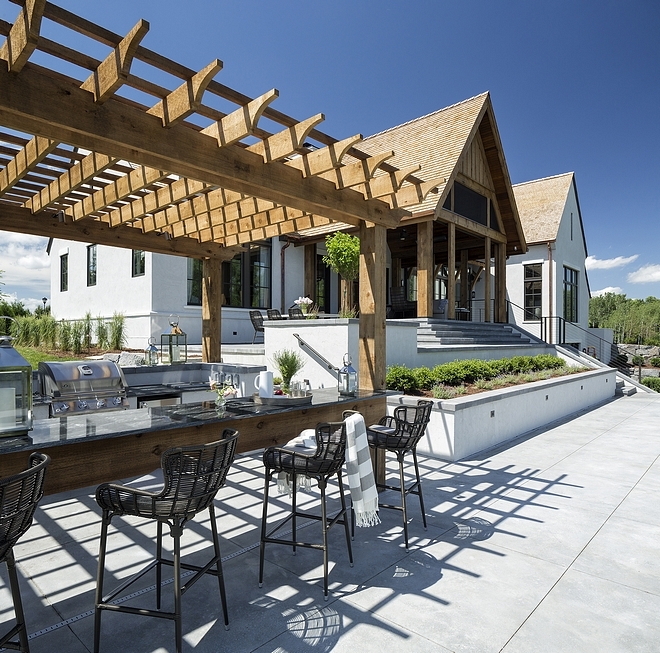 Harmonious outdoor pool blends form and function to provide the complete backyard living experience with lush landscaping and an outdoor kitchen for entertaining. 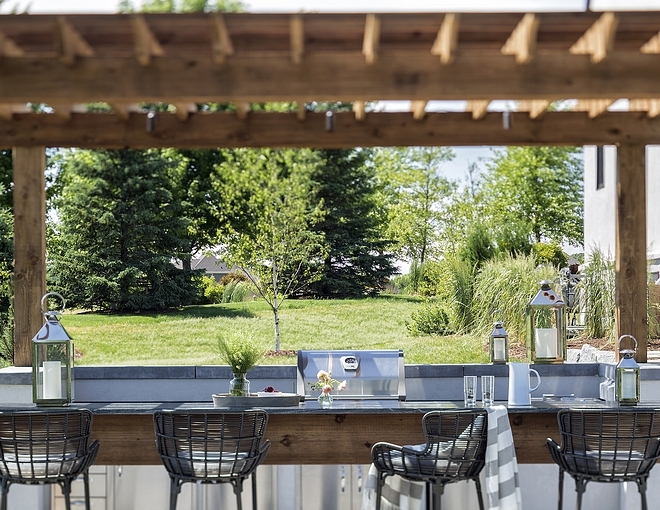 The outdoor kitchen features a Cedar pergola. The outdoor counterstools are by Palecek. 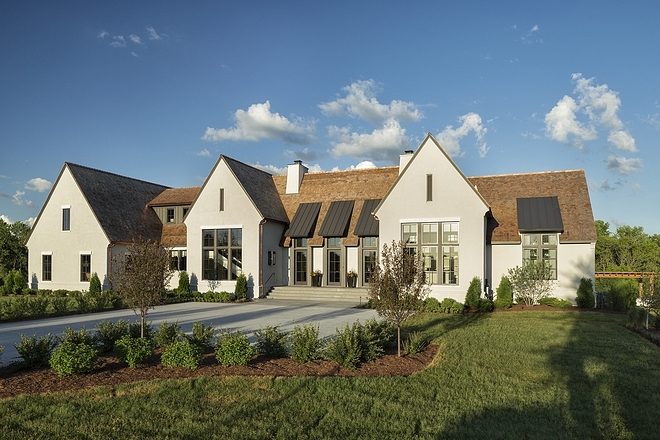 This home truly exudes inspiring architectural details that will stand the test of time. Trim: Benjamin Moore Silver Fox 2108-50. 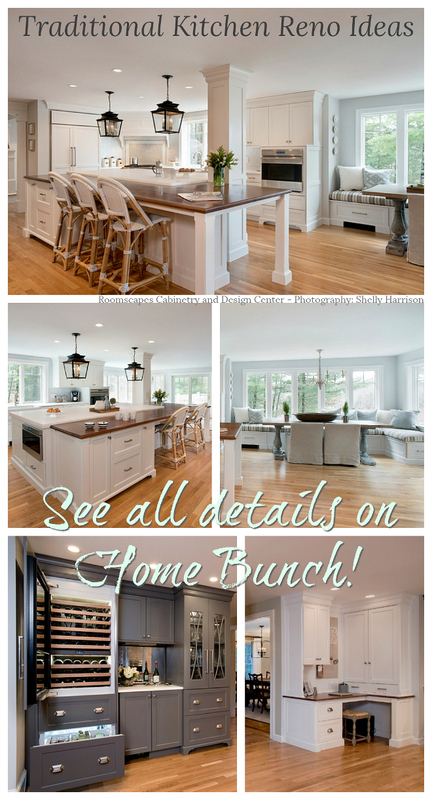 Many thanks to the builder and interior designer for sharing the details above! & Landmark Photography (including 1st image).